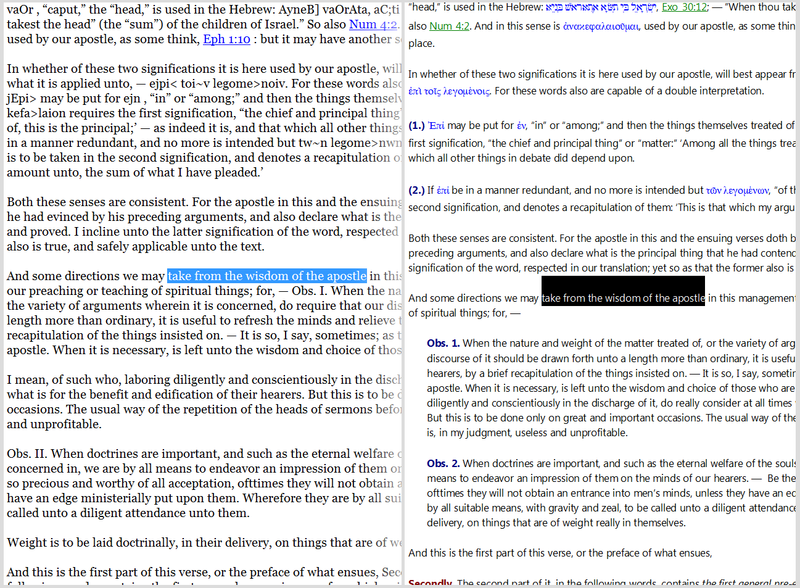 Updated 1/26/2013: Fixed Hebrews 11:1 in the commentary module. Note: This is not the poorly formatted version (with missing content) previously deleted from this website (see screenshots below for a comparison). 14 megabytes of text spanning 4,000 pages, Owen wrote as much about Hebrews as many write about the entire New Testament! That's because Owen wrote about much more than just Hebrews! The e-Sword edition included 7 volumes. The 1862 Goold edition numbered the volumes 18-24. The Banner of Truth reprting edition numbered the volumes 17-23. Regardless, the first two volumes are an introduction to Hebrew. The last five volumes contain the verse by verse commentary. Most will prefer the commentary in commentary format and the first 2 volumes in Reference Library format. For those that don't like commentary resources over a single Bible book, the Reference Library version was created for you! Wow - thanks for this! I'm actually reading the old (bad) version of this at this moment, on my Android tablet. It would be great to have the new version! - Would it be possible to make it available for MySword? PS - may I request this in the book rather than commentary form? Assuming the text is the same I think the navigation would be easier on MySword as a book. Thanks! I will convert it to MySword 2nite or tomorrow nite. If the commentary has multiple verse ranges that cover the same verse it would definatley work better as a book. I have not had a chance to look at it yet. Thanks so much! I'm so grateful for all your efforts! Found it - thanks so much! This is my favourite commentary from one of my favourite writers. There's Hebrew, Greek and Latin quotes throughout. I Haven't looked at this version yet, but if it's the same as the books in the photo above, the same set I have then there's no English equivalent. There is a set that follows the non English with a translation into English (in brackets). A quick check was beyond my expectations and a joy to use. The only problem I ran into was that witch downloaded to the Reference section.